Europa features a plethora of European themed works by a diverse group of artists. 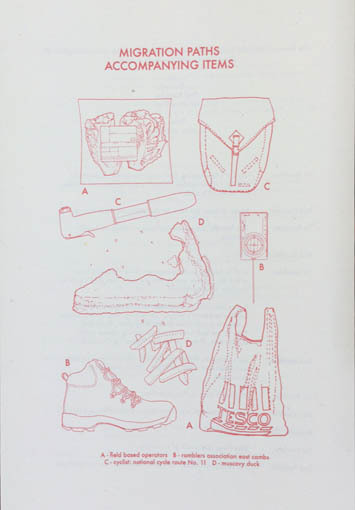 Migration Paths Accompanying Items is an excerpt from The Day of The Duck an artist bookwork forthcoming with Marmalade, publishers of visual theory, in Autumn 2016. The excerpt takes the form of a four-page printed pamphlet. The Day of the Duck follows a Muscovy duck investigating the disappearance of its fellow kind. The duck suspects a plot to eliminate unacceptable and non-indigenous waterfowl from the city’s riverbanks. The duck’s journey takes it from a distant viewpoint to intimate portrait of a rural city. During this slow investigative walk the duck encounters various city dwellers as it becomes both metaphor and representative of the meeting point of different cultures and conceptions of Englishness, epitomised by the English City. Ultimately, this ‘Duck Noir’ draws on notions of absurdity to explore, through (slightly fictional) extrapolations from daily life, how over-regulation and exclusion play out within contemporary cityscapes.